When you’re a septuagenarian the 4th of July comes with many memories. For me those memories usually include bodies of water, family potlucks, small-town or boat parades, fireworks and The Kiss. No one could ever forget their very first kiss if it took place with the whooshes, crackling hisses and booms that come with pops of brilliant colors bursting overhead in the night sky. Oh! My! God! I was fifteen and he was seventeen and when he died nine-ten years ago they had to cut him out of his house because he was so obese. I’m glad that teenage crush burned itself out because I would have hated a life that included cooking for a man who ate himself to death. How did the crush end? Exactly one year after The Kiss he gave me a line of hickeys that went from my ear all the way down to my cleavage. I was so naïve I didn’t even know what they were until my brother told me I’d better cover those up before our mother saw them. Not an easy thing to do at a lake cottage where we spent half our days in the water, but for the next few days I lived in a flannel shirt and if my mother knew why I was bundled up, she never let on. And thus my very first crush ended. On the next 4th of July when he again came to stay at his friend’s cottage, I was no longer drooling over his beautiful face and taken in by his flattering words. 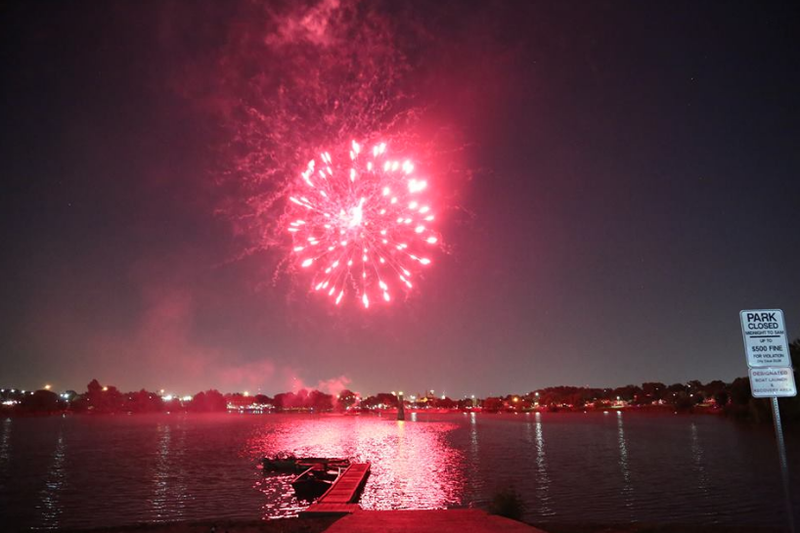 The year of our bicentennial was another memorable 4th of July. You might remember that year we celebrated the nation’s birthday for the entire summer, not just on the fourth. There were festivals and fairs, synchronized church bells, a flotilla of ships like no other on the Hudson River in Operation Sail, a laser beam via satellite cut a star-spangled ribbon here on earth and a landing pad was built for UFOs to come help us celebrate. Red, white and blue clothing, food and product packaging was everywhere that summer. I even stood in a long line to sign a copy of the Declaration of Independence that was buried in a 100 year time capsule. America’s creativity was in high gear. That was 1976 and Don and I went a little crazy collecting every souvenir we could get our hands on. We were sure saving them for the next fifty years would make us rich. 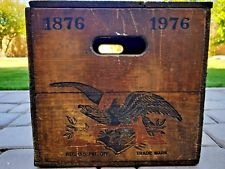 The problem was lots of other people had the same idea and all those special edition postage stamps and coins, glasses, cups, hats, jewelry, newspapers, fast food wrappings, Liberty Bells, quilt patterns and dishes are still in my basement, in a souvenir wooden crate put out by the Anheuser-Busch brewery. My husband didn’t drink but that didn’t stop Don from buying two of those boxes of bicentennial beer, the bottles from which got sold off individually twenty years ago. My all-time favorite bicentennial souvenir, though, is hanging in the back of my closet. It’s a long, loose fitting hippie-style dress with a smocked front that I made out of a light weight “homespun” cream colored fabric with small, 1976 dated flags and fireworks printed all over it. I wore it to every weekend festival, parade and bluegrass jamboree we could find that summer of ’76. Like I said, we went a little overboard and we lapped up all the patriotic theme celebrations within a 100 mile radius. My only regret is that I don’t have a photo of me wearing that dress. It was the best summer of my life. There were lots of other years when my 4th of July memories all blend into one of two categories: 1) the years when we’d lounge around a lake at either my parent’s cottage or at a cottage with my husband’s family. Food, family and roasting marshmallows over campfires after dark. It doesn’t get much better than that; or 2) the years we’d take off on mini vacations, antique hunting at garage sales and flea markets along Lake Michigan on our way up north. When we’d get there the best part was waking up in a tent pitched in a state park and hearing the waves washing the shore and the seagulls calling us down to the sandy beach. I do believe you are the first person I’ve come across that claims the 4th of July as their favorite holiday. We always had a cottage and lots of company on the 4th and I loved water related activities. The Bicentennial! I had a Bicentennial baby! (barely, she was born 12/24.) I do remember the hospital sent us a bicentennial (unofficial) birth certificate, all dolled up. I also remember we took a couple with us for the 4th of July that year to the MLB Angels game; stupidly forgetting the wife was Jehovah Witness. You can imagine how many times the American flag went across that field THAT game, and she stayed seated throughout. dur. Have a lovely day, no matter what! Your poor Jehovah Witness friend at that game! Can you imagine what the crowd would do to her today, if she went to a game and didn't stand for the pledge. Remember the case that took the pledge of allegiance out of the schools involved a boy whose teacher had beat him to death for not saying the pledge. He was a Jehovah Witness. Happy 4th July! May the next be happier. The world watches USA, as also other countries where democracy is weakening. I just think it could happen anywhere, hence my horrified interest. A bit like divorce/death/other calamity, you think: nah, couldn't happen to me and then, bang! Actually, Gerald R Ford became the 38th president when Nixon resigned and he served from Aug 1974 to Jan. 1977. The only president never elected. He had been my Representative House for decades and was a very good man. He presided over a lot of fun bicentennial events. "Happy 4th July! May the next be happier." I second that. The world is getting scarier with democracies weakening and world alliances breaking up. I'm trying this again because I've been having trouble commenting here.I hope you get this. I've been commenting, but they don't seem to get through. We are having a quiet fourth this year. It is so hot and humid here. I wish you had a pic of you in that dress, too. I had a couple of outfits that I wish I had pics of. I didn't believe he would do lasting damage to our country. I thought it would be a rough ride, but we have a strong country and we would recover. That's what I thought, but now I realize we're more fragile than I thought. I know we'll march on, but I worry more now that others will emerge who will follow his rule book... which is no rule book at all. Post comments: I wonder if you aren't seeing the verification thing to check on to prove you're human. It could also be a word you have to type. I added that a few weeks ago to cut down on a spam attack that was haunting me. Some outfits just made you feel special and good, the way they fit, the compliments you got. Kids now take so many selfies, they will never wish for photos not taken. Me too, on realizing our country's government is more fragile than I ever thought before the last election. It's very likely Trump will get a 3rd Supreme Court Justice after he appoints his 2nd which will leave a permanent legacy. I blame that on McConnell for not allowing an up and down vote on Obama's pick for seven months. Our Founding Fathers never envisioned that kind of abuse of the senate's obligations. Happy 4th, BB and everyone else! Happy 4th of July Jean or is it? Yes it is for one day where all the people of the United States can smile and be happy and enjoy being an American, at least for today. Being a Canadian does have good things but be aware, that we here in Canada do still have its problem. This year a put many Canadian flags and I still have three of them out. I have three small flags in my room, a Canadian, an American and an Italian flag. Enjoy your 4th my an American friend. See ya Jean. Oh, that first french kiss is a shocker isn't it, if you don't know about them. My first french kiss came from an Italian who couldn't speak English. Thanks for the memory. Can you believe it, I've never flown a flag! I used to own some antique flags with various number of stars but you can't fly antique flags without damaging them. And I've still got bicentennial flags, of course. Happy Canada Day back at you. My brother-in-law's birthday is Independence Day. For the longest time, he thought all the cookouts, fireworks, and hoopla were just everyone celebrating his birthday! You have a lot of special memories of this holiday. Me, not so much. It was never a big one in my family, and it still isn't. Sadly, there is already massive damage being done by this barbarian-in-chief, and it will be long-lasting, thanks to his appointments to the federal judiciary. That's why the republicans--and no, I will never capitalize that word--remain complicit in his corrupt presidency. The American government has abandoned its responsibility, its principles, and its people. So shameful. I've heard other people who have 4th of July birthdays who thought the fireworks and cookout were just for them. Funny that people born of Christmas never thing that. I agree with everything you've said in your third paragraph. I will also never, ever write or call Trump by any other title but Mr. Hoping for a more optimistic 4th next year. I'm a bit worn down today by the constant barrage of tirade and scandal from our government. You probably needed the quiet, party free 4th this year with all the stuff you're doing. Time to recharge. I'm hoping for better next year, too. I'm afraid it's going to get worse before it gets better, though. Phew, you dodged the bullet with that first kiss guy. Probably the best hickies you ever got. The 4th's of my childhood I really miss. Like you they involved water, games, family and fireworks. Today, I just stay out of the heat and since my dog is terrified of fireworks, I stay home to comfort her. Enjoy the day. If memory serves me right---and I'm not guaranteeing that---they were the only hickeys I ever got. Levi didn't mind fireworks until last year. He'd even sit on my front patio with me and watch the fireworks coming from a nearby town display. I don't know what changed but now he'll bark at the booms, must be making them different. Hope Callie gets through the next few days without too much discomfort. I never understood hickies, except I suppose as a way of "marking territory". I never found them to be pleasurable to receive and, as a result, I never gave one. My first french kiss was a mutually given and received experience, so no shockers there on either side. I hope (and I think the world hopes with me) that you can look forward to better 4ths of July in the future! Thank you and I, too, am hoping next year will bring more reasons to celebrate. My first experience with hickeys was enough for me. I do agree it's a 'marking territory' thing or a guy/girl doesn't have enough respect for the person they are giving it to and doesn't care if they are embarrassed by them. I have a lot of catching up to do -- the whole month following Memorial Day has been a bit of a blur, for a variety of reasons. One is that after I went up to KC to visit my aunt, my cousin came back with me. Once I realized we had absolutely nothing in common except that our mothers were sisters, things turned into a bit of a struggle, entertainment-wise. She doesn't enjoy the outdoors, for one thing. Sigh. Anyway, between that and the ghastly heat, I've been struggling to get back into my routine. I finally decided to celebrate Independence Day by getting caught up on my blog reading. The fact that it rained all last night and today didn't hurt one bit, and since events all around have been cancelled, I certainly don't feel like I'm missing anything! I loved the 4th of July, too. There was a lot to enjoy, given the parades, picnics, and fireworks, but my favorite thing was the sparklers. You could get a box of a dozen for a quarter, and believe me, we saved up for those things. July 4 was exciting for another reason. In those days, Maytag shut down their operations for two weeks in the summer, and it usually happened just after the 4th. We'd head off on vacation then, going to wonderful, exotic locations like the Corn Palace in South Dakota, or heading up to Minnesota to stay at a cabin and fish. My mom and I always wished the fishermen weren't so fond of Leech Lake. It may have had good fish, but those leeches were just gross. But, we coped! I remember getting leeches all over our bodies one day when we decided to go swimming in a place we'd never been before. We used up so much salt that day it wasn't funny trying to get them off from us. And they were BIG ones. We had sparklers too but after stepping barefoot on a couple my mom always had a coffee can of water near by where we had to put those spent sparklers. I've been to the Corn Palace. Is there anyone who hasn't been. LOL I always wondered what kept mice and rats from eating off the walls. Can you believe I've never wondered about the mice and rats? Now I'm curious. There must be some way -- or maybe they just keep replacing what gets eaten up. I'd love to see the place again, but I'd be a little fearful that it wouldn't be nearly as wonderful as I remember. For one thing, it seems to be used as an arena now. In memory, it was just a great, wonderful palace that was home to a Corn Princess. Now that I think about it, one of the two times I was there a bunch of crows were eating at the top. According to Wikipedia they spend 130,000 to 'redecorate' it annually. They still have a corn festival in August so I'll bet it looks its best that time of the year. Revisiting places where you loved years ago is chancy isn't it. We have more than a few of those bicentennial souvenirs too, or at least did! Ah, the things we thought would make us rich! What a wonderful walk back through memories with you! They are fun to dig out around the 4th, aren't they---both the memories and the souvenirs. Memories can make or break our feelings about certain holidays. I absolutely detest the 4th of July. Oh, and Halloween. I love Memorial Day however, oh, and Christmas. I detest Halloween as well but only since becoming an adult especially since adults are now walking around in costumes. Dear Jean, I so enjoyed this posting--down to the Trump section which just so reflected my thinking and my grief over what is happening in our country and how many people have embraced hatred for others. this past week I posted about "The Dance" when the boy on whom I had a crushed danced with me and I thought I'd died and gone to heaven!!!! So the beginning of your posting really spoke to me. What you and I both know is that change is an absolute in our lives. We live with change and somehow we have to learn to grow with it. That's hard and it must doubly hard when it's your dear husband you are grieving. Be good to yourself. Peace. I loved your post about the dance and your teenage crush, and all the comments made by other. I knew if you saw this post of mine you've be able to identify with my kiss. Our lives---people in our age bracket---are running right on time meaning when we take walks down Memory Lane and others say, "I've been there, done that too!"